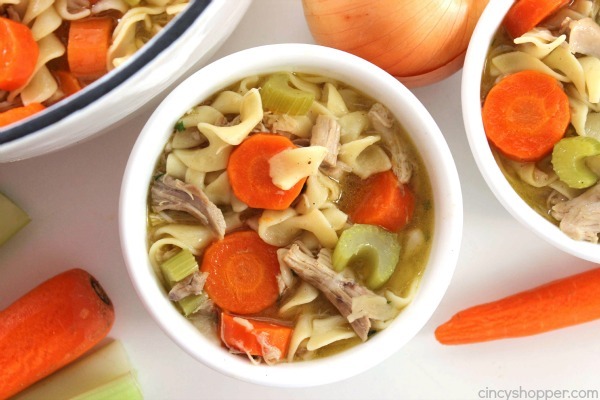 This Homemade Chicken Noodle Soup is made with roasted chicken thighs and loaded with tons of fresh veggies and flavor. 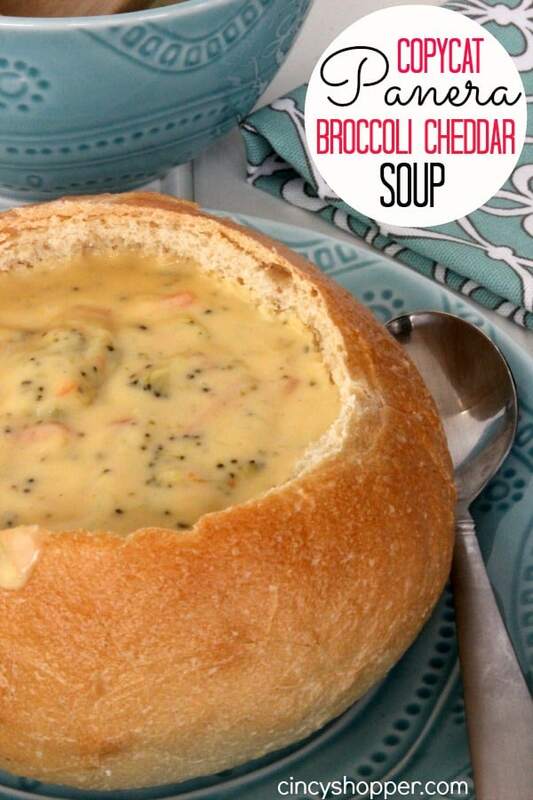 Pair this soup with a grilled cheese and dinner is perfect. 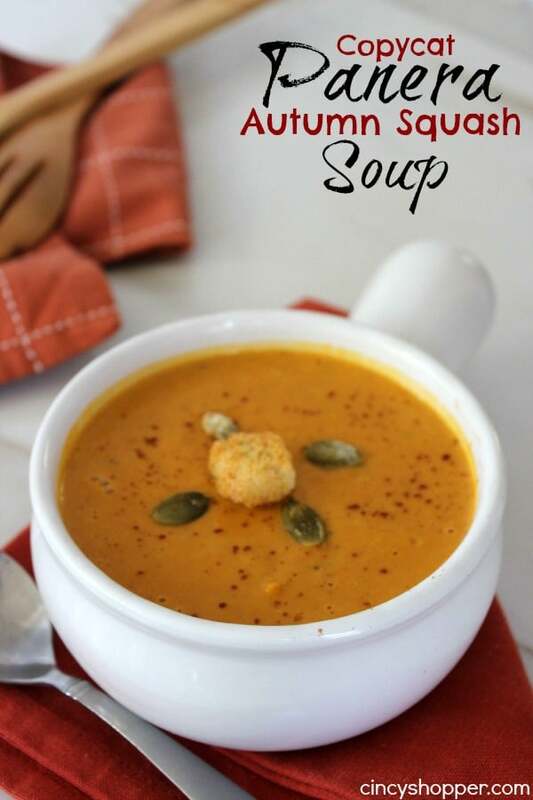 It is sure to be a hit for your family dinners this fall and winter. 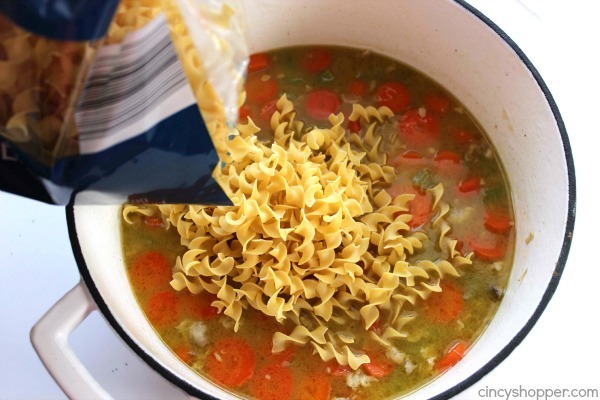 Great for having leftovers for lunches too! 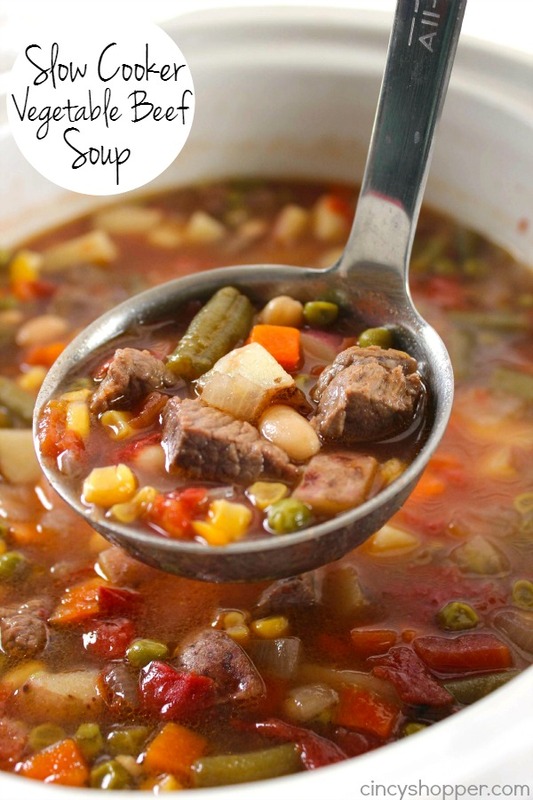 After making my Slow Cooker Vegetable Beef Soup a couple of weeks ago, I was looking forward to making more soups for us to enjoy for dinners this fall. 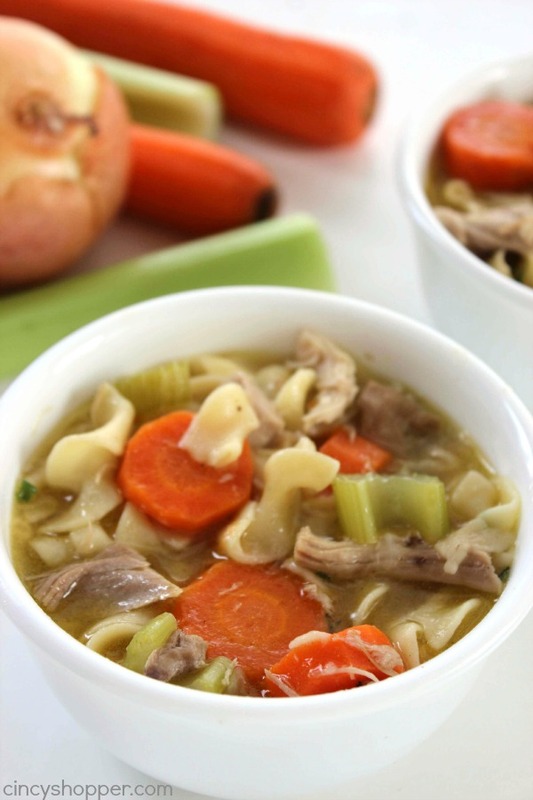 Soups are perfect for packing the leftovers in the kiddos lunches. Saves me $$’s and provides them with a hot lunch. PERFECT! I did my usual run to Aldi to check for some meat deals. I always find great markdowns on chicken and this week, I hit the mother lode. I scored some great deals on chicken thighs, chicken breasts, and also some ground beef. I love it when I score such great markdowns on meat. Prices have been through the darn roof lately. After making my Honey Garlic Chicken Thighs, I do not pass up the markdowns on chicken thighs. The flavor found in thighs is amazing! 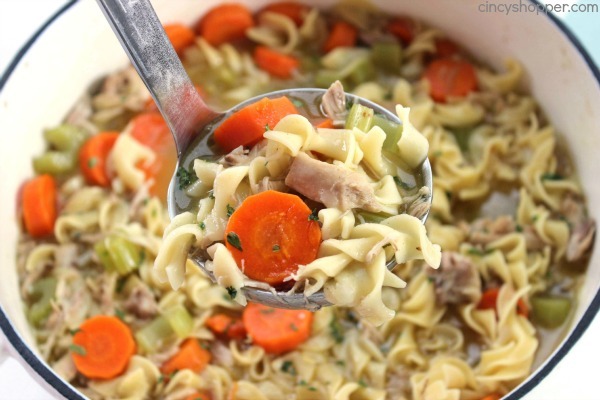 I decided to use this batch of chicken thighs I bought for this homemade chicken noodle soup. 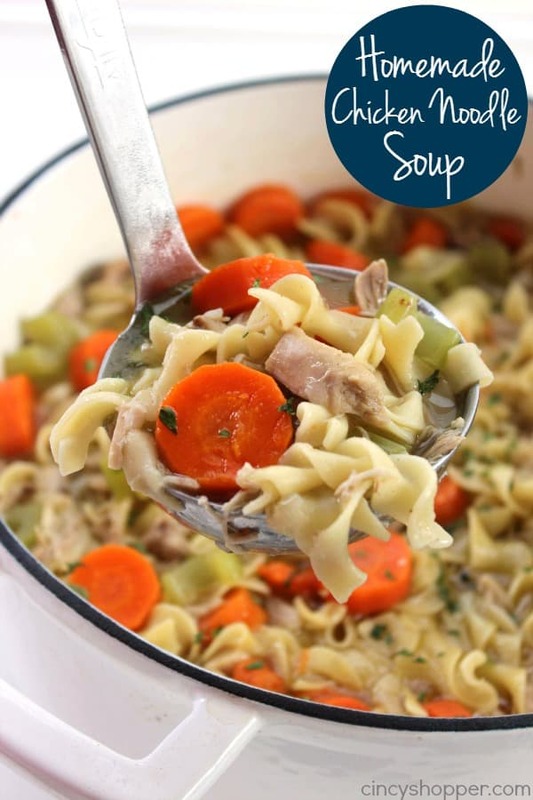 Campbell’s canned chicken noodle soup is great when you are in a rush but homemade chicken noodle soup is so much better than the canned stuff. Plus the cost of the canned has went through the roof. Maybe I am just getting older but I am finding it so much cheaper to make so many items from scratch now. 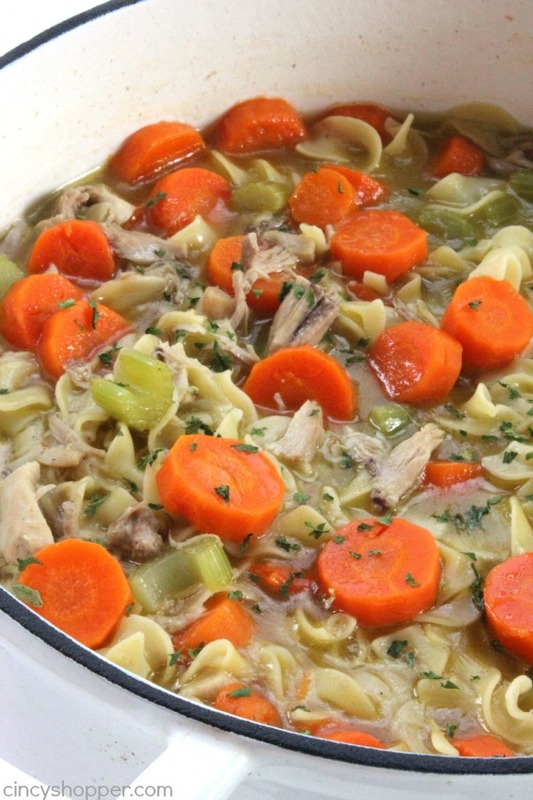 I used Fresh Chicken thighs with the bone in that I scored on a great markdown, fresh carrots, celery, onion, garlic, egg noodles, and a few other items found in my pantry. 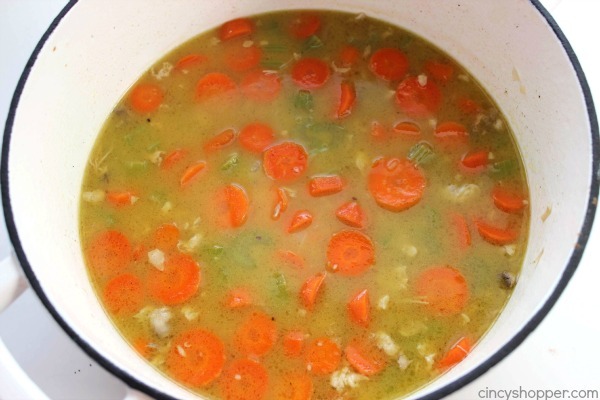 The whole process was just a couple of hours and the soup was filled with so much flavor. Season chicken thighs with salt and pepper and dust with flour. Heat dutch oven oven medium heat and add oil. Brown skin sides of thighs in dutch oven until lightly browned. 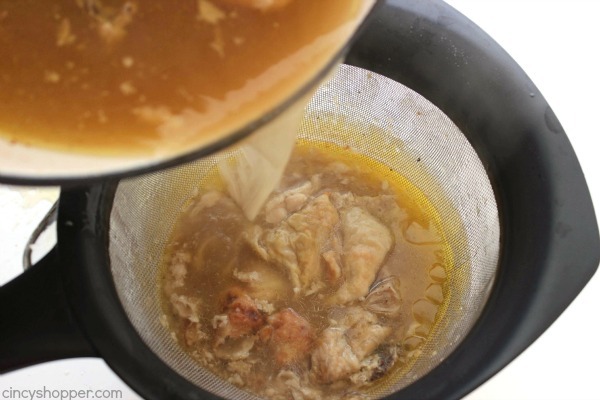 Turn chicken to skinless side and transfer dutch oven to oven for 1 hour. Add 8 cups water to pan and remove thighs to a plate to cool for a few minutes. 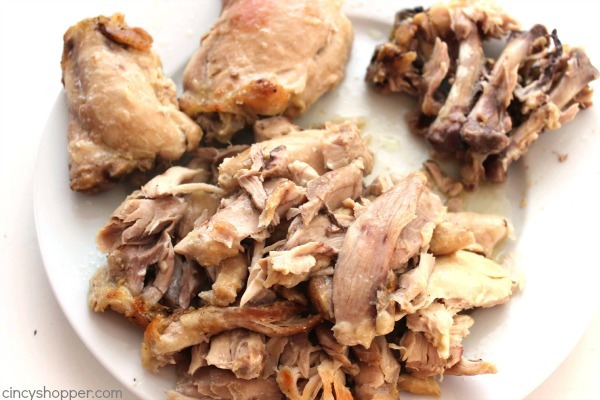 Pick meat for all thighs and set aside. Return skin and bones to dutch oven and bring to a boil over medium high heat. Cover and boil for about 90 minutes. Remove from heat and strain broth through a fine strainer and discard skin and bones. 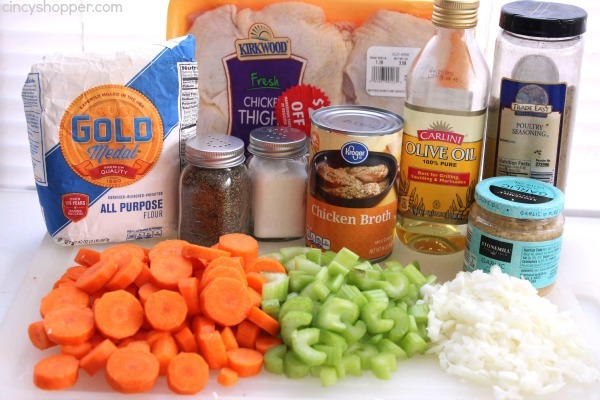 Return broth to pan and add onions, garlic, poultry seasoning, carrots and celery. 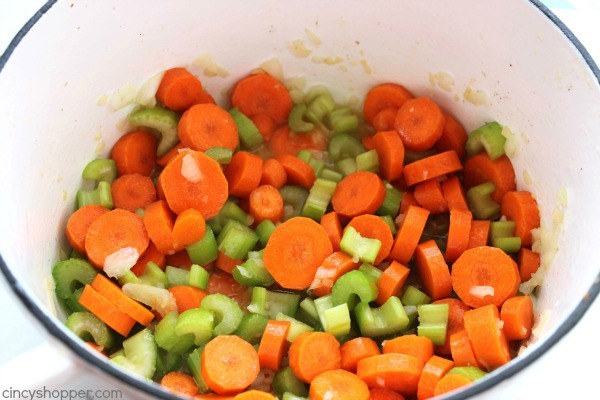 Cover and cook over medium heat for 30 minutes or until carrots and celery are tender. 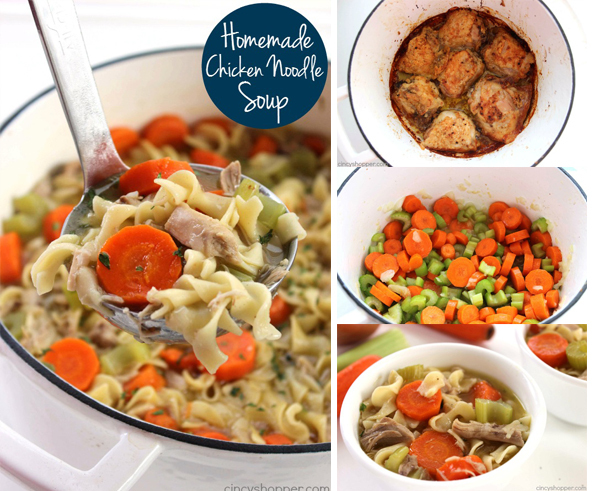 Add cooked chicken, egg noodles and broth. Cover and simmer over medium 10 minutes or until noodles are tender. 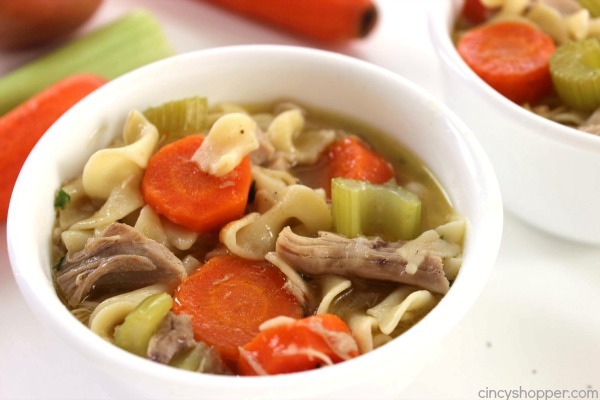 Do you have a favorite homemade soup? 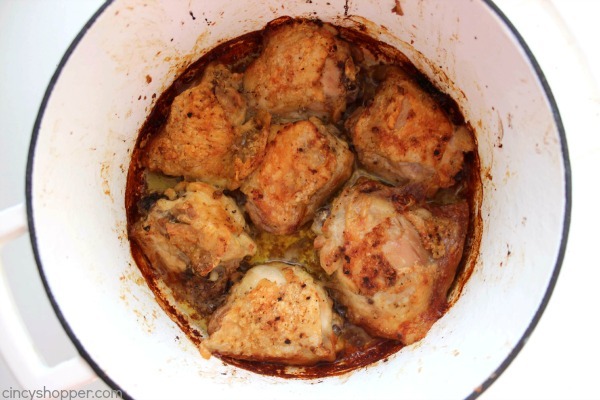 This recipe made with the chicken thighs is now on our list of frequent family meal ideas. It paired well with some grilled cheese sandwiches. The house smelled amazing when it was cooking and even my kiddos devoured it. This sounds really comforting and delicious! I came from Foodie Friends Linky Party. 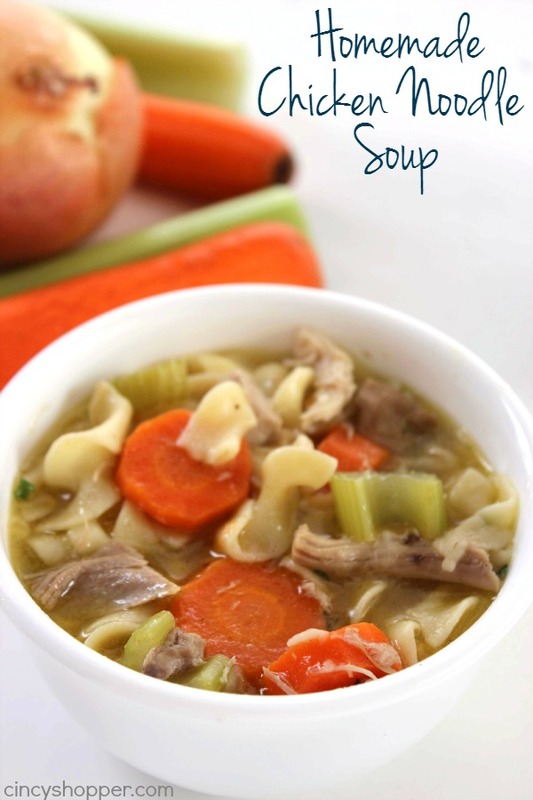 There is nothing like homemade chicken soup, it’s so comfy food. I really like your pictures!